On a gloomy, wet and grey Sunday we drove to Watergate Bay, because life is always better at the beach. 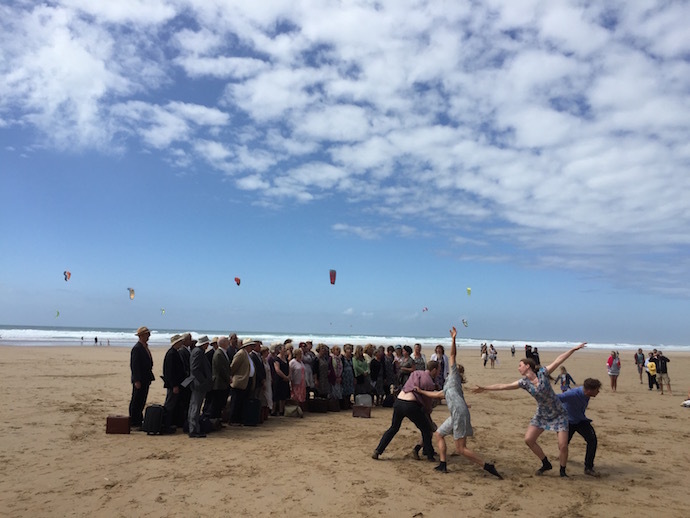 We arrived all wrapped up for winter but were greeted with glorious sunshine, as the onshore wind had blown the cloud over land. The surf was blown out but great fun for kite surfers and there were plenty of beach lovers lolling about. Located just away from the madding crowd was an incongruous gazebo and a small gathering of people who were slightly overdressed. As I played frisbee with my daughter and the outlaws (I’m not technically married) walked their dog, we discovered Dance Republic and an assortment of 5 local choirs huddled by the gazebo. 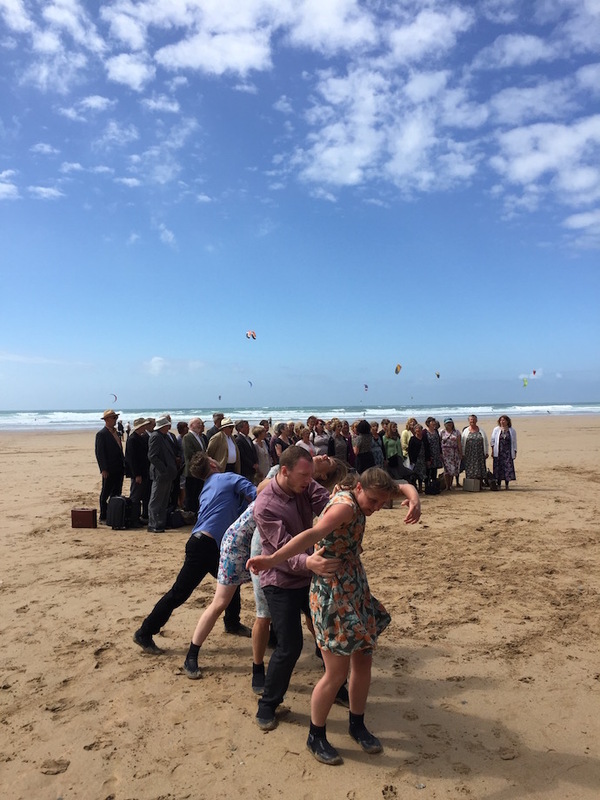 As the dancers twisted and intertwined, mimicking the turbulent waves behind, beach wanderers gathered. 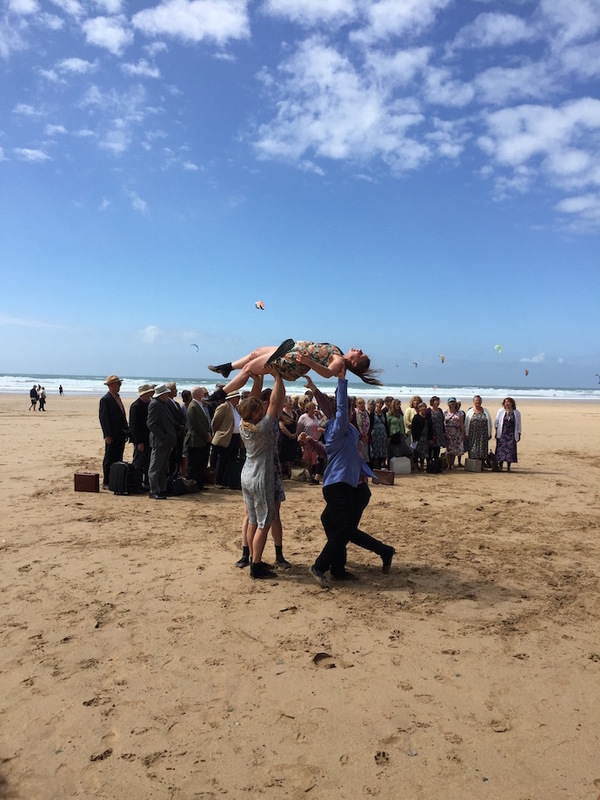 Within minutes, arts lovers, dog walkers, kids in wetsuits and parents with prams had losely encompassed this ear pleasing and eye catching performance. With the sun shining, sky glowing, wind gusting and kites fluttering, I smiled and immersed myself in sight and sound. Then my daughter perched and captivated upon my shoulders, bent down and whispered ‘Daddy, is this about caring’? 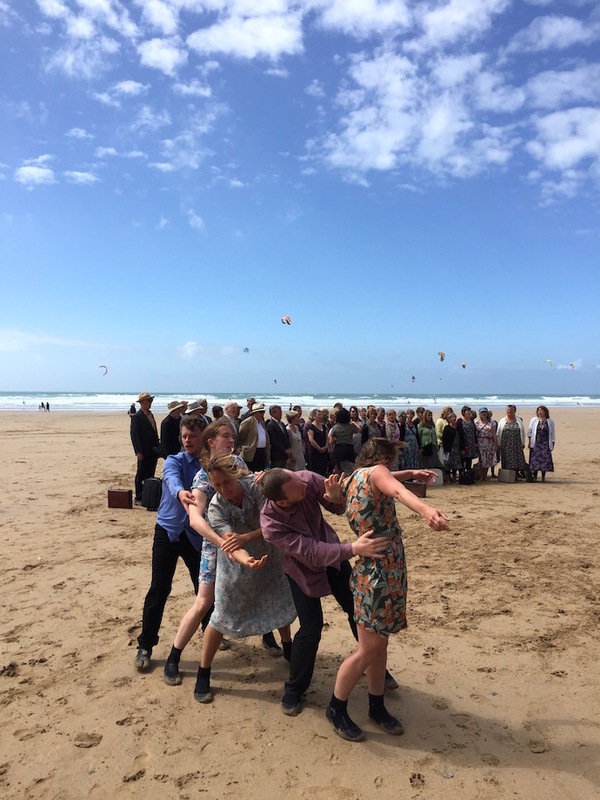 Dance Republic are performing Shoreline at Sennen and Kynance Cove throughout the week, for more details and times see the Dance Republic website. There’s no fee to watch, but a ‘pay what you can’ donation is encouraged. I have received no payment or incentive for this post. What a lovely review, thank you. I am one of the singers and it is a joy to be part of this amazing production. I love your daughter’s comment. Thanks for the lovely comment Sally, and it was my pleasure to watch and review. I see from you blog it has also been endorsed by Dawn French!